Our season review series has reached the point where it is time to do the impossible: evaluate coaches. No one has come up with a good way to do it, at least from the outside. For the most part we just project player performance onto coaches. Leo Mazzone was a genius pitching coach when he had Greg Maddux, Tom Glavine, and John Smoltz. When he had Rodrigo Lopez, Kris Benson, and Daniel Cabrera? Not so much. The 2017 season was the last season for this coaching staff as a unit. The Yankees parted ways with manager Joe Girardi after the season and they broke up the coaching staff as well. Most of it, anyway. 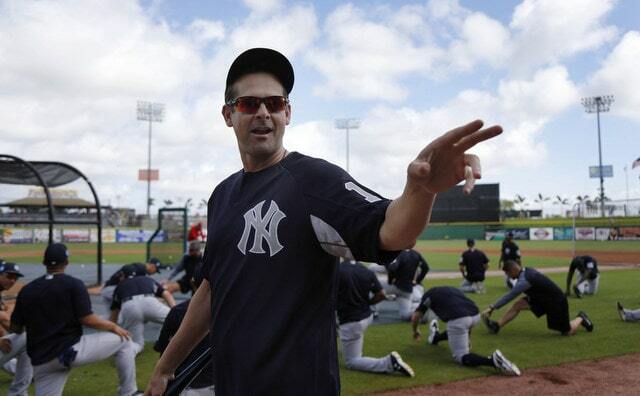 New manager Aaron Boone will inherit at least one coach and possible more. Let’s try to review the season that was with the coaching staff. The 2017 season was Thomson’s 28th with the Yankees. He joined the organization as a minor league coach in 1990 and gradually worked his way up the ladder, holding a variety of coaching and front office positions along the way. This was his fourth season as Girardi’s bench coach (2008, 2015-17) and his tenth on the coaching staff overall. He spent the 2009-14 seasons as the third base coach. Two things about Thomson’s season stand out to me, one good and one bad. Let’s start with the bad. Why didn’t he push harder for Girardi to challenge the Lonnie Chisenhall hit-by-pitch in ALDS Game Two? Argh. Girardi obviously did not trust Gary Sanchez enough to challenge it, but Thomson is his right-hand man, and a quick little “Joe we really need to challenge this” could’ve done wonders. Alas. And two, Thomson received unsolicited praise from Girardi and Alex Rodriguez during the postseason. Girardi credited Thomson for his work with the team’s young players — “Rob Thomson, he stays on these guys all the time to make sure they’re in the right place and ready to go,” said Girardi during the ALCS — and A-Rod said something similar during a pregame segment for FOX. They both credited Thomson for working with the kids. The Yankees did interview Thomson for their managerial opening, though I wonder whether that was something of a token interview, and a sign of respect for all his years in the organization. Thomson said he wanted to remain with the Yankees even if he didn’t get the job, and when he didn’t, he decided to take the Phillies bench coach job. It seems to me the Yankees decided to move on from Thomson, not the other way around. Luis Severino rebounded from a disaster 2016 season to become an ace in 2017, earning him a third place finish in the Cy Young voting. That happened because he worked with Pedro Martinez in the offseason though. Severino worked with Pedro then avoided Rothschild all season. CC Sabathia’s resurgence continued thanks to the cutter he learned from Andy Pettitte or Mariano Rivera last Spring Training. I dunno, it was probably one of those guys. Masahiro Tanaka had a rough first half, which was Rothschild’s fault, then rebounded in the second half, because he figured some things out on his own, I assume. Dellin Betances walked a lot of guys this season, something he’s never done before in his career, and that is also Rothschild’s fault. Rothschild also convinced Tyler Clippard that throwing 90 mph fastballs middle-middle is great way to get outs. And remember when Aroldis Chapman credited Rothschild for helping him get over his issues by tweaking his fastball grip? He was crediting Rothschild out of pity. The Yankees decided to bring Rothschild back next year — he is the only confirmed holdover coach at the moment — which I guess means Severino will have to avoid talking to him and Chapman will have to continue giving him pity credit for things. Looks like we’re in for another year of complaining about a very successful pitching staff. A year ago the Yankees scored 680 runs. This year the Yankees scored 858 runs. They scored their 680th run this year on August 30th, in the 132nd game of the season. That’s pretty great! Of course, it helps to have a full season of Sanchez, for Aaron Judge to become literally the best power-hitting rookie in the history of the universe, for Aaron Hicks to break out, for Didi Gregorius to take another step forward, for Austin Romine to inexplicably hit .314 for a month while Sanchez was on the disabled list, plus a bunch of other things. The single biggest reason the Yankees improved offensively this year was the change in personnel. A year ago the Yankees gave 1,173 plate appearances to A-Rod, Mark Teixeira, and Brian McCann, who combined to post a .301 OBP and a .380 SLG. Yeesh. Out with the old and in with the new. How much credit do Cockrell and Thames deserve for Sanchez doing what he did, and Judge doing what he did, and Hicks doing what he did? Impossible to say. Surely they had something to do with it. If nothing else, the players made Cockrell and Thames look good. But apparently not good enough to save Cockrell’s job. He is reportedly out with Thames taking over as the full-time hitting coach, though that has not yet been confirmed. The Yankees had the highest stolen base success rate in baseball, but they also ranked 20th in their attempt rate. Does that mean Pena didn’t do his job well because the Yankees should’ve run more? Well, no. Personnel matters, and it’s not just the guy on first base. Why would you send Brett Gardner when Judge and Sanchez are due up? Just let them hit with a man on base. The extra 90 feet isn’t worth the risk with those two dudes at the plate. As for Espada, the third base coach, the Yankees had 20 runners thrown out at the plate this season, the fifth most in baseball. But! They also had 111 runners score from second on a single, the fifth most in baseball. On one hand, the aggressiveness paid off based on all those runners who did score from second on a single. On the other hand, having 20 runners thrown out at the plate kinda stinks, especially with the offense the Yankees had this year. Holding a runner at third and passing the baton to the next guy is a-okay with me. Espada and Pena will not be back next season. Well, Espada won’t for sure. I thought he would get a chance to interview for the manager’s job, but that didn’t happen, and he is now the Astros bench coach. Pena? He did not interview for the managerial job and it doesn’t sound like he is coming back. I know Pena is a fan favorite — is it weird a coach is a fan favorite? I think that’s kinda weird — but it really seems like the Yankees are going for wholesale changes with their staff, not one or two tweaks, so Pena is likely out. Harkey really nailed answering the phone and waving his hat whenever a reliever was ready this season. Good response time, great hat-waving form. Knocked it out of the park. Harkey is a Girardi guy — they’ve been friends for a very long time, since they were Double-A batterymates in 1988 — and I figured that meant he would be gone as well, but apparently he will be back as bullpen coach next season. Huh. It hasn’t been announced yet, but multiple reports say so. Rothschild is coming back, Thames and Harkey are reportedly coming back, Thomson and Espada are gone, and Cockrell and Pena figure to be gone. It’s been a good run with that staff. Things will be different going forward. It has been two weeks and six days since the Yankees parted ways with Joe Girardi, and so far they have interviewed two managerial candidates (Rob Thomson, Eric Wedge) and have two more interviews scheduled (Aaron Boone, Hensley Meulens). Hal Steinbrenner told Bryan Hoch today that once the list of candidates is cut down, they’ll be brought to Tampa to meet the Steinbrenners for a second round of interviews. Here’s the latest on the manager and coaching staff searches. Dodgers third base coach and former big league utility man Chris Woodward is a candidate for the manager’s job, report Mark Feinsand and Joel Sherman. An interview is not scheduled yet but is likely to happen. Sherman says the Yankees intend to cap their interviews at five or six candidates. Thomson, Wedge, Boone, and Muelens are four. Woodward would make it five. Woodward, 41, was in camp with the Yankees as a non-roster player in 2008. He jumped right into coaching after his playing career ended in 2012. Woodward went from Mariners minor league infield coordinator in 2013 to Mariners infield coach in 2014 to Mariners infield and first base coach in 2015 to Dodgers third base coach from 2016-17. He’s said to be highly regarded within baseball and has been considered a future manager for a few years now. John Lott wrote a feature on Woodward last year. Sherman says Beltran reached out to Brian Cashman to let him know he wants to manage — Cashman danced around the question when asked about Beltran as a managerial candidate the other day, telling Andrew Marchand, “I am aware of his interest in managing in the future. I’ll leave it at that for right now” — though it doesn’t sound like he’ll get an interview. I think Beltran would benefit from spending a few years as a coach just to see how the other half lives before diving into managing. He’ll manage one day though. For sure. According to multiple reports, pitching coach Larry Rothschild will return next season no matter who the Yankees hire to be the next manager. A few weeks ago we heard the new manager will have a say in the coaching staff, but apparently that doesn’t apply to the pitching coach. This isn’t that unusual. Both Joe Torre (Willie Randolph, Tony Cloninger) and Girardi (Kevin Long, Tony Pena) inherited coaches when they joined the Yankees. Pitching coaches Don Cooper and Rick Honeycutt have been through multiple managers with the White Sox and Dodgers, respectively. Rothschild, 63, has been New York’s pitching coach since 2011, and during that time Yankees pitchers rank third in ERA- (94), third in FIP- (93), and second in fWAR (+139.6). Sherman says the Yankees like Rothschild’s “ability to blend analytics with hands-on work with the staff,” plus he is widely respected around the game, so that’s why they’re keeping him. I’ve said this before and I’ll said it again: I think the impact of coaches is overstated. They’re important! But they’re not miracle workers. Rothschild has a great reputation within baseball and that’s enough for me. Can’t say I blame Leyritz for trying, but yeah, that was never going to happen. Not much of a surprise here, but according to George King, the Yankees have yet to make contract extension offers to their front office and coaching staffs. General manager Brian Cashman, vice president of player development Gary Denbo, vice president of baseball operations Tim Naehring, manager Joe Girardi, and the entire coaching staff are unsigned beyond this season. I’m sure a bunch of others too. The Yankees have, historically, waited until contracts expire before negotiating new deals. That used to apply to players as well, though the team came to their senses with that a few years ago and are now at least open to the idea of extending a player before free agency. The last few times Cashman and Girardi have been up for new deals, they became free agents and then worked out new contracts. Denbo, who has helped turn the farm system into a player development machine, is reportedly under consideration for a position with the Marlins. He and Derek Jeter are very close — Denbo managed Jeter in the minors back in the day and was his big league hitting coach in 2001 — and it makes sense that Jeter would look to bring in someone he knows and trusts to run the team he’s about to purchase. Front office and coaching staff contracts typically expire October 31st or at the end of the World Series. If the Marlins sale takes a while, it could give the Yankees a leg up on re-signing Denbo, who I can’t imagine will want to wait around for the Marlins sale to go final and leave his future uncertain. The Yankees could lock him up before Jeter fully controls the Marlins, which doesn’t sound imminent. Of course, the Marlins could always approach the Yankees about Denbo after the sale goes final. Teams interview personnel under contract with other teams all the time. With permission, of course. The Yankees could deny that permission — they denied the Diamondbacks permission to interview scouting director Damon Oppenheimer back in 2010 — though most teams don’t when it involves a big upward promotion. Denbo could always push for having permission to interview elsewhere put into his contract. We’ll see. 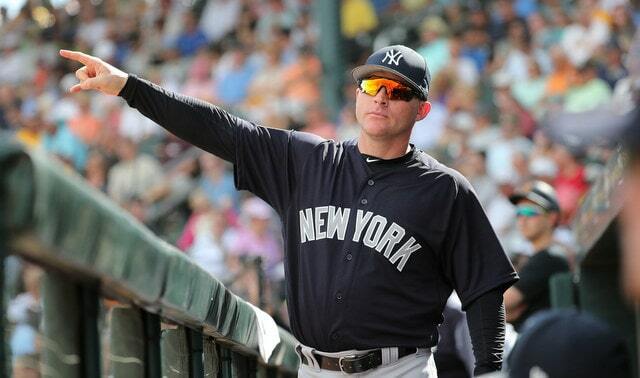 For now, neither Denbo nor Cashman nor Girardi nor anyone on the coaching staff is under contract beyond this season. No one has a contract offer in hand either. I wonder if this will lead to some coaching staff changes? I guess it depends on Girardi. If he returns, which I think is likely, chances are his coaching staff will remain mostly intact. If Girardi leaves, all bets are off.